This article is about the game Mario Tennis for the Nintendo 64. For the Game Boy Color game of the same name, see Mario Tennis (Game Boy Color). For the series as a whole, see Mario Tennis (series). Mario Tennis, known in Japan as Mario Tennis 64 (マリオテニス64 Mario Tenisu Rokujūyon), is a Nintendo 64 video game. It features Mario and his friends playing tennis, and is the second installment in the Mario Tennis series (although the first in the modern incarnation of the series) and the follow-up to Mario's Tennis for the Virtual Boy. This game introduced Waluigi as a rival of Luigi, and also Princess Daisy and Birdo's re-entries into the Mario franchise. The Game Boy Color counterpart is Transfer Pak compatible with Mario Tennis. The game begins with the launch of the Mario Star Tournament. Mario and a prominent cast of characters (including some newcomers like Princess Daisy and Birdo) walk out onto the field, where it switches to a walk-through of more playable characters, and a quick zoom in on two shadowed figures. Eventually, the tournament is started and characters are matched up. Mario defeats DK, Yoshi defeats Daisy, Princess Peach defeats Birdo, and Luigi defeats Paratroopa. In the semi-finals, Mario defeats Yoshi and Luigi defeats Peach. The finals starts with Mario and Luigi beginning their match by looking for the tennis ball, when suddenly Wario and his new side-kick Waluigi bust in to challenge them. As Waluigi enjoys his new introduction, Luigi exclaims he's not afraid of this new character. Waluigi, now angered, challenges Luigi. Mario tries to calm the two down when Wario confronts him. The four are about to have-it-out, when a gloaming spot-light shines down upon them. As Toad (who is the announcer) points and shouts, "What's-that!? ", Bowser and the hovering Boo fall onto the court below, knocking Wario and Waluigi backwards. Everyone appears disgusted that Bowser would try to ruin a tennis match. To everyone's surprise, the pair announce they have come to play a friendly game of tennis. As everyone is baffled, Mario breaks the silence by exclaiming, "Let's all play!". As Peach and Daisy look to each other and agree, everyone, including Wario and Waluigi, follow suit. Out of nowhere, a Bob-omb makes its way onto the field. Without time to act, everyone is caught in the blast, and the game begins. 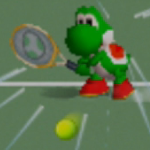 Including all the characters that can be transferred from the Game Boy Color version of Mario Tennis, the Nintendo 64 version of Mario Tennis features a total of 20 playable characters. Of these characters, 14 characters are default, 2 characters (marked with a double asterisk) are unlockable through playing the Nintendo 64 game, and 4 characters (marked with a triple asterisk) can be transferred from the Game Boy Color game. Aside from the transferable characters, characters are divided into 5 different play styles, listed below. Waluigi (marked with an asterisk) makes his first appearance in the Mario Tennis series and the overall Mario franchise. Short Game and Tiebreaker are the only modes that can be played with the same characters. When two of the same character is selected, the second player to select said character will have an alternate palette swap of the character. All of the returning cast from Mario Golf retains a returning palette from that game. Note: The name before the dash is the player's character, and the name after the dash is the CPU. A serve begins each point in tennis. A single player serves each game, and players alternate serving throughout the course of the match. If the player wishes to serve, they must press either or , then or again plus a direction on the to execute the serve. The right timing can result in a "Nice" serve, which is a bit more powerful and quicker than a normal serve. There are three main techniques when serving: Normal Serve, Serving "Out of Bounds", or Serving "Down the Line". Serves are their special shot counterparts. 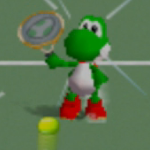 Therefore, if the player double-taps when serving, they'll hit a topspin serve. Double-tapping on the serve serves a Slice. Holding and produces the most powerful serve of the game: the Smash serve. If the player fails to hit the box during an opening serve, the player gets a fault and getting another is called a "double fault" and the server forfeits the point. Daisy about to receive a Top Spin. 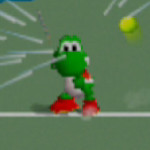 A basic, run-of-the-mill shot in Mario Tennis is the Top Spin shot. This shot has a higher arch to it, curving into the ground after it crosses the net. The player must hit a Top Spin shot by pressing and aiming with the analog stick. A tail is added to a Top Spin shot by the player double tapping the button. This will make the shot a bit more powerful and add an orange fire trail (tail) behind it. Koopa Paratroopa misses a Slice. A Slice shot has a lower trajectory and less of a bounce off the surface of the court. The Slice shot is performed by the player pressing and aiming with the control stick. The player charges their slice shot by double tapping the button. When they do this, a light blue trail (tail) will appear after the ball. Mario lobs a shot over Luigi. The player can lob a shot over an opponent's head by tapping , then . The player can aim with the control stick to bury a lob in the back court. The Lob is especially effective against weaker, quicker players who come to the net. When a player lobs a shot, a star shape will appear where the ball will fall. The player taps , then to hit a soft shot that glazes over the net and "drops" a few feet from the net. If an opponent is deep on the back court when the player performs the maneuver, they will have to sprint forward to make a play on the ball, which often leads to Mis-Hits. Wario misses a Smash Shot. A Flat Shot can be executed when the player press and simultaneously. This will send a fast flat shot from the character's racket. If the character assumes a stance to prepare a forehead shot when the Flat Shot is executed, the character will execute a Smash Shot instead. The Smash Shot is the toughest in the game to return. It is especially effective when used at the net. Sometimes, a ball may be returned weakly or on opponent will use a Lob, which will cause a star to appear where the ball will bounce, allowing the player to easily find the right place to charge the Smash Shot. 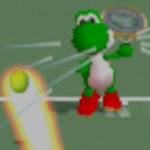 A Smash Shot is indicated by a glowing pink energy trail, that the Flat Shot misses. Both of them are denoted by a peculiar sound effect while receiving and by pink sparks coming out of the racket as the ball is hit. To charge a shot, the player must press and hold either , or both . The player's character will begin to spark, indicating that power-up has begun. A charge-up shot is not only more powerful, but easier to control as well. Furthermore, while charging, the character will automatically hit the ball if it is within reach, and they will even leap if this is needed to reach the ball; however they will also move very slowly until they hit the ball unless they are a "Tricky" character. It is possible to cancel charging if they misaligned the shot. The player does this by tapping in the midst of their charge-up. Depending on both the position and the trajectory of the ball when a charge is started, the character will assume one of three stances while charging the shot, influencing both the leaps that the character is able to make to reach the ball, the speed and preferred direction of the following shot and, in the case of Flat Shots, the actual type of shot. The character prepares to execute a forehand shot, resulting in a shot whose range of possible directions is skewed toward the side of the non-dominant hand. If needed, while assuming this stance the character is also able to leap in the direction of the dominant hand to reach the ball. The character prepares to execute a backhand shot, resulting in a shot whose range of possible directions is skewed toward the side of the dominant hand. If needed, while assuming this stance the character is also able to leap in the direction of the non-dominant hand to reach the ball. The character prepares to hit the ball with a special forehand shot in which the racket mainly goes vertically and above the head, resulting in a powerful shot. If the character is charging a Flat Shot, a Smash Shot will be executed instead, this being the only stance allowing this kind of shots. This is also the only stance that allows vertical leaps to reach balls flying above the head of the character, as well as allowing leaps in both vertical and a lateral direction (either toward the dominant or the non-dominant hand). The ball after hitting the net. 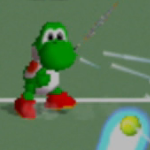 Mis-hitting the ball usually occurs when the player's character does not have an optimal approach. Shots fly past the end line, miss wide and fade before reaching the net, or even the ball hitting the net. Mis-hits usually occur when the player is moving toward the net. A common mis-hit is to dribble a ball off of the player's racket after a Slice shot. This happens when they are attempting to Smash a Slice shot on the return. If the player gets hit by the ball, the other team will get a point. From the baseline, the player can boom huge ground strokes and work the entire court. Playing the baseline also allows the player to track down anything the other player throws their way. The baseline works well for slow players (Bowser for example) and more powerful players. It is best used by quicker players who have a lot of reach. When at the net, the player can stay near the center, but must be ready to move laterally to track down shots that try to get by the player down the sidelines. The player may angle shots to the opposite side of the court their opponent is on, or use different techniques, for example, a drop shot can be very effective in some circumstances, whereas a Topspin may be a better tactic at the time. A doubles match on the clay court. Doubles is a much different mode than singles. It can either be easier or harder than singles, depending on the player's perception of difficulty. The court is split into front and back sections. When the player is serving, it is their responsibility to cover the back. When they are not serving, they get to play the net. When being served to, the player's position will alternate. If the player is receiving the serve, they will play back on the point. If not, they've got the net. Another difference from singles play is that, on doubles play, the lateral extremities of the court count for the purpose of scoring, whereas in singles, when the ball lands in the side sections, it counts as out and the point goes to the opponent. In addition to the straight tennis matches offered in Mario Tennis, several special play modes are also available which are playable both individually or with another CPU or Player. These modes offer a variety of different matches and minigames that differ from standard tennis, or pre-created tournaments. A one set versus match. The exhibition mode offers the player a match in which they can customize their match. They may choose to either play singles or doubles, the length of the match, the difficulty of the opponent, and the court that they play on. The player can choose five different difficulties, which are Novice, Intermediate, Expert, Pro, and Ace. The player can also choose who their opponent or partner is. 1 Set: Play one set of two games. 3 Sets: Play three sets of two games each. This mimics the final round of the Star Cup tournament. 5 Sets: Play five sets of two games each. 1 Set: Play one set of six games. 3 Sets: Play three sets of six games each. 5 Sets: Play five sets of six games each. Once the players have selected the number of games they like to play, an opponent is determined, if playing a one-player contest. The difficulty of the opponent can be adjusted too. After the players' foe has been determined, they must select a court to compete on. If they have unlocked any of the special courts, the courts are displayed here. The first tournament in the game, the Mushroom Cup a standard, basic tournament with easier than average opponents. The opponents are slower and relatively unskilled. The Mushroom Cup takes place on the Hard Court. Held on the Clay Court, the Flower Cup showcases slightly harder opponents on a harder court than the previous cup. However, the opposition are still not much of a challenge to experienced players. The Star Cup is the hardest cup of the normal tournaments. The opponents in this cup offer a harder challenge to the player. The court played on is the Grass Court. There are three more tournaments available in Mario Tennis, which need to be unlocked. To access the Rainbow, Moonlight and Planet Cups, the player needs to win the Star Cup in singles with all 16 characters. Once done, the player must "star" a character by pressing and holding the shoulder button while selecting a player. This allows the player to participate in the Rainbow Cup. The player has to beat the Rainbow Cup to get to the Moonlight Cup, and win the Moonlight Cup to get to the Planet Cup. Beating all singles and doubles special cups with all 16 characters will unlock the Max difficulty mode for computer players. The Rainbow Cup is a slight bit more of a challenge than the Mushroom Cup, yet still not very hard. The only significant difference between this and the Mushroom Cup is strength of the serve. Players here also deal a bit more power with their shots. The Moonlight Cup is a similar to the Flower Cup, except in number of games played. Held on the Clay Court yet again, the Moonlight Cup’s second round is a 3 Set Match, and its final round is a longer 5 Set contest. The competition level here is the same as that of the Star Cup, albeit much longer in the term of games. Every match leading to the final is a three set match. The final match of the entire game is five sets long, much like the Moonlight Cup's final match. The Planet Cup takes place on the Grass Court, like the Star Cup. Wario and Toad in the middle of a Ring match. The Ring Shot Challenges invites the player to compete in several contests to see how many rings they can collect in various matches of skill. In all except the Game mode, the challenge works like a tie break. The serving alternates every two turns. Three rings appear on the court at a time. Each time the player collects one, another one will reappear on the court. As the player progress through the Ring Shot challenges, they'll receive a number of the same opponents appearing. Probable opponents have been noted for each stage of the four challenges. In multiplayer modes, players and/or teams compete who can get 50, 100, or 200 rings (depending on which of the three is selected). In Doubles Match, the music is different than usual, and players can score rings either in Teams (two players on the same team) or in Battle Royale (individual players per team). Game: In Game mode of the ring challenge, the player must collect Rings by playing against an opponent. The player must collect all the rings without winning or losing against their opponent. Time: The player must get the required amount of rings in the time specified to clear each challenge. Even if the player misses a ball, they'll get to serve, or be served to again. Ball: Keeping the ball in play is the key here, as there is no time limit. In the final Bowser stage, the player will have five balls to work with to get the required score. Fault serves do not count as balls. Points: The object of this challenge is to get the required number of points before the time expires. In this stage, rings grow from small to very large. The smallest ones are worth the most, while the biggest are worth almost nothing. 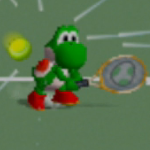 This version of Ring Shot in this game is also used in the mode of the same name in Mario Tennis Open. A group of characters holding items. Bowser Stage takes place on a floating court suspended by chains above a lake of lava. This game is a nod to Mario Kart, where the player can collect and use power-ups against the player's opponent. The court pitches and shifts throughout the match, and the player will have to contend with the weird gravity as a result. Running up it will take the player more time, and the down slope will pull them down toward the lava. The ball also reacts differently to the surface angle. The other major difference between this and normal tennis are the power-ups that are collected and used. They hover near the center of the net in glowing cubes (similar to Mario Kart) and become the players when they send a ball through one. The power-up then appears in the corner of the screen and can be used by pressing the button. Banana Peel: When the player uses this power-up, a banana peel attaches itself to the ball, then deposited on the court when the ball bounces. This puts a potential slipping spot on the court, forcing the players opponent to play around the peel, lest they slip and fall. However, if the ball does not hit the ground, but is volleyed, the banana has the potential to be placed on the other side of the court. Mushroom: Using one of these mushrooms grants the player faster speed. Lightning Bolt: When used, a bolt of lightning strikes the opponent, rendering them temporarily dazed. Star: Power is increased by the player using a Star. The shots will gain more power and be hard to return if well-placed. Other power-ups can be used with the Star. Koopa Shell (Green): The next shot after using this power-up will be followed by a trio of shells, which will temporarily stun the opponent. Koopa Shell (Red): This power-up sends out a homing shell that seeks out the opponent and knocks them over for a moment. The Piranha Challenge pits the player against four opponents: one Mario team player and three Piranha Plants. The three plants spit fifty balls randomly, and the object is to return them past the net camper and out of play. The Mario team player stays mostly in the center of the net. If the ball somehow does make its way to the center player, the center player returns it, and it may not count towards the score. There are four courts for the challenge: Hard, Clay, Grass or Composition. Special Games is a special mode including Short Game, Tiebreaker, Ring Tournament, and Demo Mode. Short Game is a multiplayer mode where the character or team must score up to 5 points to win the match. Tiebreaker is equivalent to Short Game, except it goes up to 7 points. Short Game and Tiebreaker are only for two players for a Singles Match and four players for a Doubles Match, and never use the computers at all. The Tiebreaker mode is the only mode where two players can be the same character. When two of the same character is selected, the second player to select said character will have an alternate palette swap of the character. For example, if both players pick Mario, the second player to select him will have Mario in his Fire Mario outfit. Ring Tournament is a Special Game challenge mode and service for players per copy of the game to have their high scores depending upon how many rings they each collected submitted to the leaderboard with the players' entered names to the Mario Tennis website. Before playing, the player was required to enter a code for each of the special cups, including character-based ones. The codes came from the former official N64 game website for that game which ran from 2000–2004, and would change from time to time. The service ended in 2004 after the game's sequels Mario Power Tennis and later Mario Tennis Open replaced it for that URL, and every possible code entry will end with the message "This code is incorrect". This Special Game mode has been removed in the Wii Virtual Console re-release of the game due to the service and URL being shut down. It still can be seen in the special games menu but it can't be selected or even highlighted. In Wii U Virtual Console re-release, Ring Tournament was fully implemented again. In this mode, all of the characters in the Singles Match and/or Doubles Match are computer-controlled, allowing the players to watch the matches as if they were watching a sports event. However, the skill levels for each character cannot be chosen, therefore it is decided randomly which character or team will win the match. After beating an opponent in exhibition or winning a cup, results and trophies are recorded on the Results Screen. 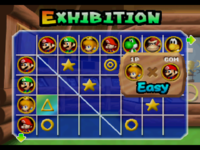 Beating an opponent in exhibition mode will result in a shape being placed on a grid, indicating that the player has beaten that opponent. Different shapes mean different difficulties, with a triangle being "Novice" and a star being "Pro". Every court plays a bit differently. Each court can be selected for Exhibition matches once unlocked. Open Court Normal Normal Only available during Special games. Hard Court Normal Strong The surface used in the Hard Court yields a higher bounce than other courts. Clay Court Slow Weak The clay court makes players move much more idly. Grass Court Fast Weak The grass court yields a lot of low, fast shots. Composition Court Very Fast Normal Not available in any tournament, the composition court is a super-fast surface. Mario Bros. Court Fast Weak Win the Mushroom Cup with Mario in singles. The Mario Bros. Court has a picture of the famous plumbers emblazoned upon it. This surface slightly favors All Around players. Baby Mario & Yoshi Court Very Fast Weak Win the Mushroom Cup with Yoshi in singles. The Baby Mario and Yoshi Court goes well with speedy players. Wario & Waluigi Court Slow Very Strong Win the Star Cup with Wario in doubles. The ball is slow but bouncy. This benefits taller and quicker players. Donkey Kong Court Fast Very Strong Win the Mushroom Cup with Donkey Kong in singles. The court has a super-quick ball and ultra-bouncy surface. This favors power players. Mario & Luigi Court Fast Normal Win the Star Cup with Mario in doubles. A zippy surface, the Mario and Luigi court is great for a fast-paced match among friends. Power and all-around players will thrive. Bowser Court Normal Very Strong Win round three of the GBC Mario Tennis minigame, Two-on-One. Then transfer the data through a Transfer Pak. A court built on the shadowy world of secret courts. Piranha Court Normal Normal Get a perfect score of 50 on the Piranha Challenge. Only available in the Piranha Challenge. 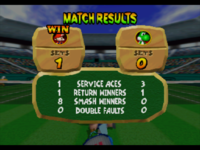 For this subject's image gallery, see Gallery:Mario Tennis (Nintendo 64). N64 James Temperton, Cubed3 9/10 "'It really is that good. Stuff your Tim Henmans and your Andy Roddicks all we want to know about it Wario and Paratroopa! Superb depth in gameplay and a wonderful feel for how the game plays in real life make this title a privilege to play. Add to that a superbly evil multiplayer and controls so perfectly balanced that you glide about the court with style and you have the best sports game on the N64. We normally don't wax lyrical about something unless it is very special, and judging by our comments thus far this title is well worth your attentions. It'll be your own fault if you ignore it." N64 Marcel van Duyn, Nintendo Life 8/10 "With Mario Tennis, the portly plumber proves once again that he can make any sport more entertaining. The game later received a sequel on the GameCube and Wii, which, despite mostly being very similar, introduced some questionable gameplay elements that many did not particularly enjoy. If you were one of those people and would rather have a pure, unspoiled Mario Tennis experience, look no further: this is his best outing so far." Goomba, Bullet Bill, and Whomp were suggested to be made playable, along with a "Warupichi" as a potential evil counterpart to Peach, but these were all dismissed for varying reasons, such as Goomba and the Super Mario 64 Bullet Bill's lack of hands, and Whomp's rigid posture. The idea for a rival for the Princess was dismissed by Shigeru Miyamoto. Alex, Nina, Harry, and Kate are no longer playable in the Virtual Console versions of the game, nor can the transfer-related personal courts be unlocked in that version as well, due to the Wii and the Wii U lacking an equivalent to the Nintendo 64/Game Boy Color Transfer Pak. Despite this, the data for all the characters are still in the game. This is the only game where the current Donkey Kong and Donkey Kong Jr. are seen together, not counting Donkey Kong Jr.'s background cameo in Waluigi Stadium in Mario Kart: Double Dash!!. This also marks Donkey Kong Jr.'s final playable appearance to date, not counting later ports of his game of the same name. This is the only game in the Mario Tennis series where the announcer is Mario himself. He is the referee unless he's playing, in which case, a clone of him becomes the referee and wears different clothes depending on the tournament, plus a blue version of Mario's cap. On a side note, on the title screen and group artwork used for that screen, Peach can be seen sitting on the refereee's seat despite that only Mario (and his clones if Mario is playing the matches) is the referee. In tiebreakers, "0" is read as "oh". Later Mario Tennis titles have that number read as "zero". This page was last edited on April 4, 2019, at 19:26.